Issabel TCS-CC800 is one of the best sellers in Call Centers. It has a unique and optimized factor, with clear voice feature. 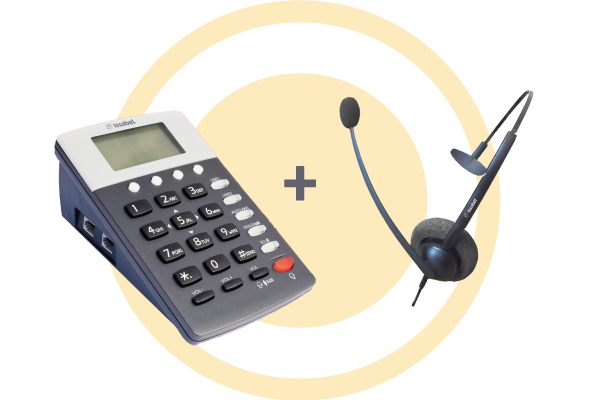 Take advantage of CC800 series with IssabelPBX phone features, such as: call transfer, auto answer, music on hold, call waiting and more. TCSH12 is a professional call and contact center dedicated headset. Includes a comfortable design with an excellent noise cancelling effect microphone. Durable and flexible microphone hose, enables you to freely adjust to any position. One key enable or disable accounts register function. One key enable or disable auto-answer function. One key change the ringing type. USB port for external unit charging. Sensitivity: 108±3dB (at 1 KHz 1mw). Sensitivity: -38 ±3dB (0dB=1V/Pa, 1 KHz).